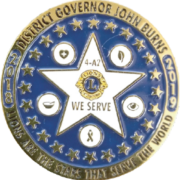 Lion John Burns was born and raised in East Texas, graduating from Stephen F. Austin State University with a B.S. in Forestry. Upon graduation, he was commissioned a Second Lieutenant in the U.S. Marine Corps, and served 20 years in the Corps. He is currently working for a manufacturing company as the I.T. Director. Lion John has been married to his wife, Lion Judy, for 40 years and they have 4 children and 9 grandchildren scattered across the U.S. in California, Arizona, Colorado, and Louisiana. 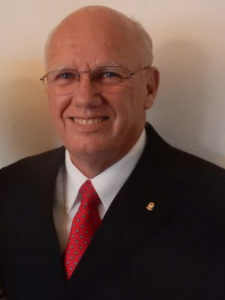 Lion John joined the Riverdale Lions Club in May 2005, and has served as Tail-Twister, Secretary, Vice-President, President, and Board Member. He has also served at the District level as a Region Chair twice, Cabinet Secretary three times, and GL T Coordinator. Lion John is a Melvin Jones Fellow and Harry J. Asian Fellow. He has received an MD4 Excellence Award, and has been Lion of the Year for the Riverdale Lions Club. Lion John has demonstrated a life-long commitment to service. As a youth he was active in Scouting, attaining Eagle Scout and serving on the local Council Camp Staff several years. During college, he was a member of the Alpha Phi Omega fraternity, a service-oriented fraternity. Lion John’s 20 years of service in the Marine Corps and his continu­ing service al church as a lay speaker and church treasurer reflect his continued commitment to service.